This product is sent via email. The United States federal government is the biggest purchaser of goods and services in the world. And that includes video. They produce a ton of videos every year and most of it is produced by independent producers who took the time to learn the ropes and register their business with the government. But it’s a tiny percentage of producers who bid on and produce these videos. What kind of videos you may ask? Everything you can imagine and lots you cannot. This page has examples of government videos. 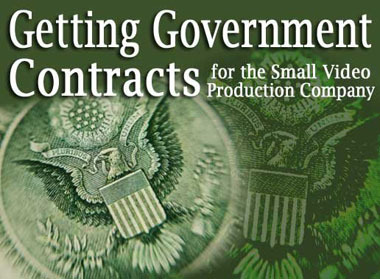 The government is required to give most contracts to small businesses. How do they define small business? If your company grosses less than $29 million a year, the government considers your company a small business. Who can bid on government videos? Any video business that has a track record. The government usually won’t give a contract to a business if it doesn’t have positive cash flow and if it hasn’t been in business for at least two years. In 2008 the government awarded a record $93.3 billion in contracts to small businesses. This is increasing with the stimulus money. Not all of that is for video, of course. They also invest in museums, jets, roads, parks, veteran hospitals, and thousands of other things. But there are a whole lot of video contracts just waiting for the smart producer. Here are just a few condensed examples of videos and opportunities you’ll find in Getting Government Contracts. You’ll notice these were not written by video producers. Voice of America (VOA), and Office of Cuba Broadcasting (OCB) are seeking qualified individuals for freelance Radio, Television, Internet, and/or Multi-Media English and/or foreign language news broadcasting assignments in various locations, domestic and overseas. Assignment areas include script writing, editing, on-air announcing, technical and production services, photo editing, video journalism, graphic illustrating, producing programming using state of the art multi-media platforms, and audience mail analysis. The U.S. Forest Service needs two short High Definition, museum-quality videos for two visitor centers in Alaska. The contractor (producer) is responsible for the planning, production, and completion of the two videos. These artistic products need to reflect the themes and key take away messages as listed in the solicitation. These will be made available for public viewing beginning in 2012. The contractor will provide all the labor, materials, services and facilities to research and prepare a script, provide appropriate images, direct location shoots and gather images and sound recordings to produce a 13 to 15 minute high definition video to orient visitors to the entirety of the Tongass National Forest at two world class visitor centers. Production company wanted for producing four 7-10 minute videos to be used in a medical research study. The videos will contain re-enactments of a scripted medical encounter in which either a Caucasian or African American doctor discusses lifestyle, diet, and treatment recommendations with either a Caucasian or African American patient who has diabetes. The scripts for the videos will be based on actual doctor-patient encounters. The scripts will be provided to the producer. Rough cut versions of the nearly-completed videos will be reviewed by the research team and a group of patients before final editing will be performed. Producer roles will include casting, providing crew, location scouting, filming, initial editing of beta videos, final editing, and delivery of the 4 videos. These are just a few of the government contracts for video that are put out for bid and you could live anywhere for most of them. Many of them are produced by producers who are not in the immediate area. You have to register and we’ll show you how to do that step-by-step. We’ll also show you how to find lots more projects you can bid on. It’s not a static list. There are always new videos that are needed. And the low bidder is not always the winner. Many factors can determine who wins the bid. Some of the government people you work with will be experienced video producers; others will be fairly clueless about video production, but both need to hire video experts like you to produce specific videos for the government. This is very much like working with your present clients except that the government produces more video than any client you’re likely to have including TV networks. We’ve put together an ebook to get you into this steady stream of government contracts for video production jobs. We’ll show you step-by-step how to get your company in line to bid on these interesting video jobs. And we’ll interview producers who have won numerous government contracts for video. You’ll learn how to see prices lists and other bid information of successful video producers. A word to the wise: Qualifying and getting these jobs does require methodical work, doggedness, and the ability to follow detailed instructions. It will take patience and determination. But for some companies, this is a great source of profitable, interesting video projects. Just a few thumbnails from government videos from independent producers. These are only stills.